Well, what do you know... our favourite summer treat made it to CNN! In the Philippines, summer is welcomed with makeshift stalls selling halo-halo, which literally means "mix-mix". It's because that's what you exactly do with it. Various sweetened produce (bananas, sweet potatoes, beans, coconut strings, gelatin are piled at the base of the tall glass (or a bowl), then crushed ice is packed on top of it, followed by a good pouring of milk and with leche flan and/or ice cream to top it off. Then mix-mix-mix it all up with your spoon! 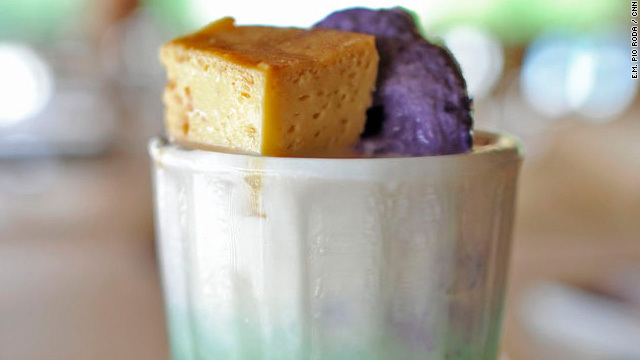 I'm truly delighted that halo-halo made it to CNN's Eatocracy (photo credit to this site too). We acquired an ice crusher specifically for making halo-halo in the summer, which is December here. I hope they also discover the many rice cakes we have. If you'd like to make some of this wonderful treat too, there's a recipe here in adobongblog! yumm! love the leche flan and ube on top.